The Marian Medallion Project: from Design to Delivery – E-Book Now Available! At the beginning of March, I shared with you a very heartwarming, kind gift from a reader, Cindy Russell, who compiled my Marian Medallion Project into book form and sent me two printed copies of the book. Your feedback from that article was much appreciated, and it prompted us (both Cindy and I) to look into printing options for the book. Alas, the expense of print-on-demand for a book this size is rather high, making it an unlikely investment. So instead, I decided to make the book available as an e-book – that is, as a downloadable PDF that will work on computers and devices that have the ability to open PDFs. I’m really excited about being able to make it available to you! There are many special features to the e-book that make it worthwhile to own. How ’bout some highlights? The e-book version of The Medallion Project comprises 287 pages, so it’s quite large! But in this case, large is good, because it is extremely thorough in instructional content, photos, and cross-references. The book is divided into three main parts: the rose, the medallion, and techniques, with an introduction at the beginning and appendixes at the end. 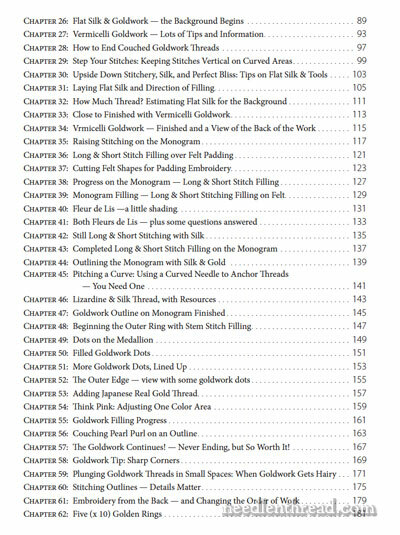 The table of contents at the beginning of the book is interactive – you can click on each chapter title and jump straight to that chapter. 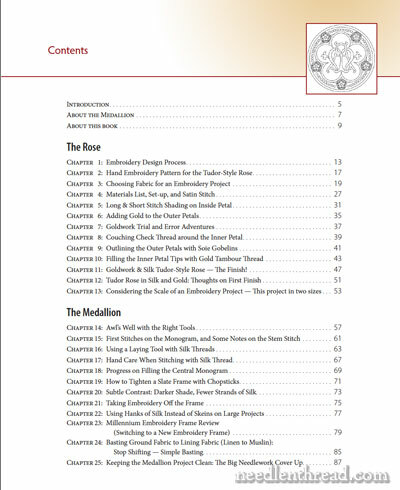 The Techniques section includes all related instructional articles, from how to dress a slate frame, to comparisons between different thread types, and more! The Appendixes offer a thorough resource page, on which you’ll find listings for shops that carry the all the types of supplies used in this kind of goldwork and silk embroidery project, and a fabulous Index. The e-book is a complete and thorough compilation of the entire Medallion project. It is portable (on tablets and devices that read PDFs), it is printable (you can print one page, a chapter, or the whole book for your personal use! ), and it is completely interlinked and cross-referenced throughout, to make navigation and exploration super-duper easy. You’ll find linked cross-references to other chapters that clarify or further explore the subject matter; you’ll find links to other helpful instructional tutorials on Needle ‘n Thread (for example, to video tutorials and so forth); you’ll find links to the original articles on the website. Here, you can see up close some examples of this interlinking throughout the book. This ease of navigation is perhaps my favorite aspect of the whole e-book! It’s so easy to move around through the book, learning from the various chapters and seeing how the topics are related to each other. Additionally, you’ll find selected comments included in the text for each chapter. These are reader’s questions and my answers that further clarify the chapter topic. Finally, the Index!! Another favorite aspect! 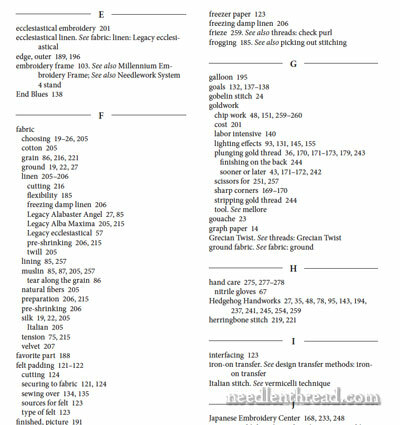 The index is a thorough listing of all key terms, concepts, names, stitches, materials, etc., throughout the book, with active page links for each page number, so you can jump straight to any page that includes the term you’re looking up. I love this! It makes it so easy to find information – there’s nothing better than a good index in any informative or instructional book! 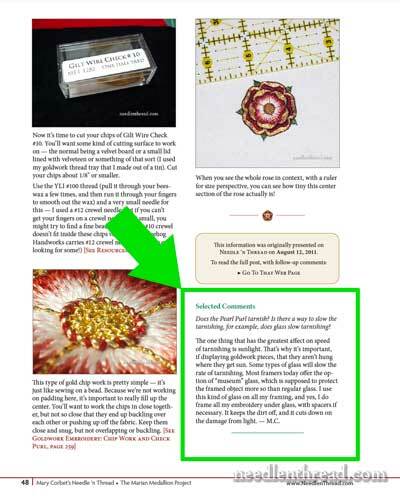 The Medallion Project: from Design to Delivery is available for download in the Needle ‘n Thread shop. This week only, it is available to you for $26, after which it will be regularly priced at $29.95. The file is delivered to you via e-mail with a download link. The file is a PDF (51MB), and can be read on PCs, Macs, laptops, iPads and tablets, and any other device that supports PDFs. The download time for the file will vary depending on your internet connection. 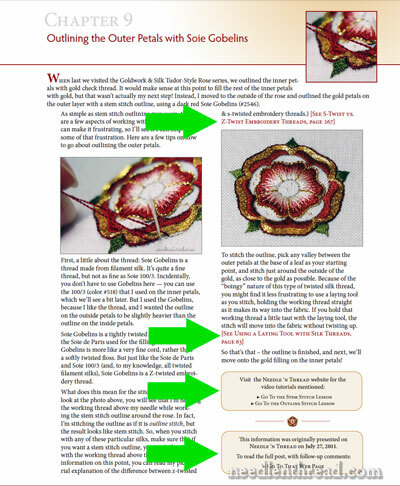 So, if you enjoyed following the Medallion Project on Needle ‘n Thread and you want a thorough, compiled version of the project and all its related instruction for your personal use – whether to print or to view on your computer – get your copy of The Medallion Project: from Design to Delivery e-book today! 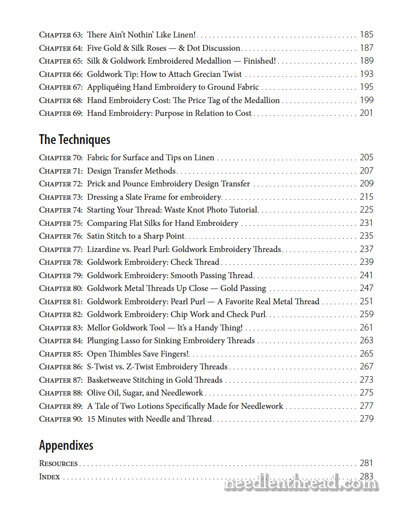 April 10, 2014 Japanese Embroidery – E-Book Available! Mary, when you first showed us Cindy’s book, I was thoroughly impressed. Cindy, you did a professional job on assembling this book. And you made it extremely informative. I think the best way i can describe it is, “WOW.” Thank you both for sharing it with us. It is worth every penny. Well done for entering the e-book market! I’ve been writing e-books for use in my classroom and I love the ability an author has to tailor the content to the needs of a very specific readership. 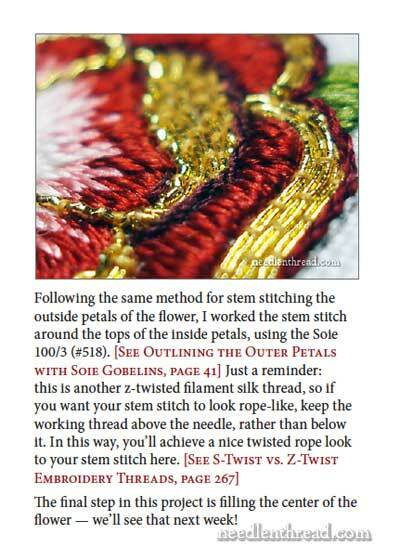 All the “bells and whistles” of an e-book make it a perfect medium for something like embroidery. I applaud your decision to create this book in PDF format so all readers have access to it regardless of which device they choose to use to read it. I just received the e-book, and I am so impressed. Thank-you, and thanks to Cindy, for sharing this amazing work. Fabulous, I’ve ordered it. Many thanks. I have just bought a copy and I have been browsing through it, it’s great so much to read and well worth the money, thanks to you Mary and Cindy for such a thorough and detailed book on the Medallion project. Even though the book is about one project it covers so many different aspects of embroidery and gives sound advice on most needlework related subjects. Well done a book every embroider should have. Why not publish through Amazon for ebooks? They will even supply the software. Thank you both for the work in putting this book together. I have often bemoaned trying to figure out an easy way to get between various articles and review topics from the Medallion Project. Most of the problem is on my end due to slow, old computers. But, now thanks to the e-book, which has already been printed and spiral bound, I’m ready to sit back and go through the entire project again. It will also be so great to have the book out and open to particular pages as I’m working through my current project. Thank you both so much again. I only have one suggestion. Please, please consider putting together more e-books from Mary’s articles! Mary, Congratulations on entering the eBook market. It seems to be a totally sensible way to circulate books such as this one. Printing costs are way too high. For Spring Gardens, printing costs me $35 and when bound, selling at $40 looses me money. This is ridiculous and not acceptable to a consumer. You appear to have done an excellent job of reference and highlighting. Congratulations and best wishes. Ann B. Now to do this (build index) and TOC for your entire blog….would be absolutely invaluable. Thank you Mary and Cindy! So happy that you have made this available to us! I really appreciate it! Such a great idea making it an e-book that we can print out if we want. Get thee behind me Satan, uh Mary. Get thee behind … oh heck, just give in gracefully. What a temptation, even or especially to a non-goldworker. This book just looks so luscious that a crazy bibliophile like me just has to have it. Thank you, Cindy and Mary for making it possible. I can’t wait for the ding! that will tell me it has arrived in my Inbox. I don’t want one, but I have to say that the book is simply amazing. As was the project, of course. Wonderful that it has been so thoroughly documented. I’ve just had a problem submitting a previous comment to you, so if you have received it, please delete this one. 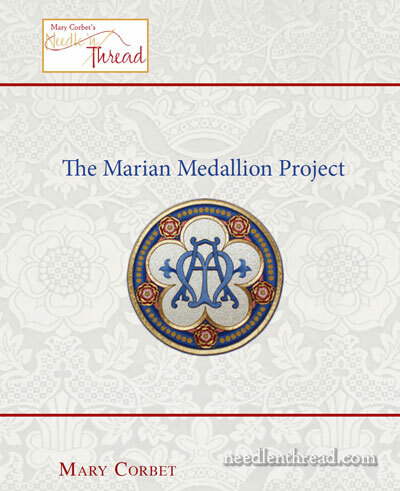 I’ve just downloaded and looked through The Marian Medallion Project e-book and it is so much more than any other embroidery book I’ve bought. It covers every aspect of the project’s embroidery and will rate “up there” with embroiderers’ “MUST HAVE” books very soon. Thank you very much Mary and Cindy. Hi Mary, I just love your Marion Medellion project and have purchased it on line. I am very keen to make this and I am wondering if there is a precise materials list available. I live in New Zealand and may not be able to get all the items here so will probably make contact with shops you have recommended in the States. I would like to have the colour numbers for the silk and full names for the gold threads as there seem to be so many to chose from. When I order online I like to have all the details available. I think you have done a wonderful job on this embroidery and the book is fantastic . The amount of detail to carry out the stitching is amazing. I hope you can help me. Thanks in advance, Jane. Next Next post: Happy Easter – and a Free Pattern!